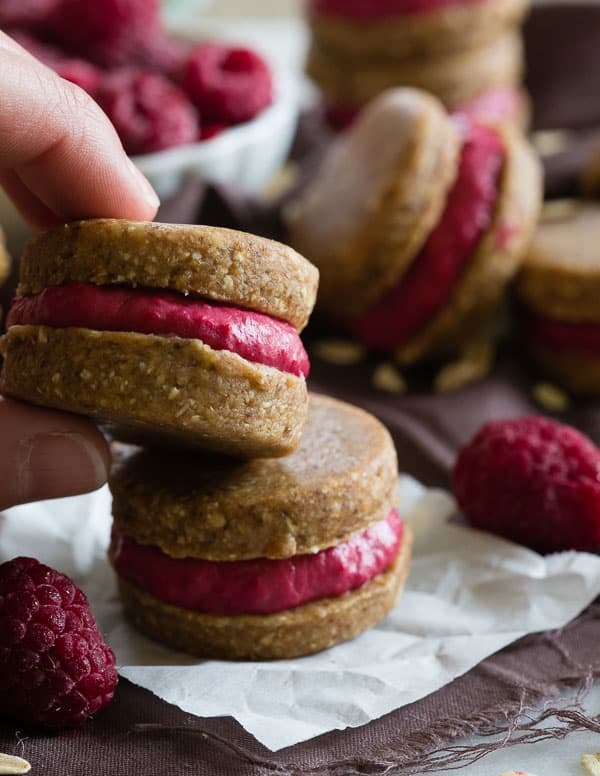 These oatmeal raspberry sandwich cookies are no bake, gluten free and the perfect healthy way to indulge in something sweet. Somehow, I’ve gone almost 33 years (ugh, the fact that that happens in 5 days makes me sick to think about) without ever trying an oatmeal cream cookie/pie. Sure, I remember the Little Debbie’s packaging all over the grocery store with them but when there were yodels and cupcakes to be had, oatmeal cream pies didn’t stand a chance. 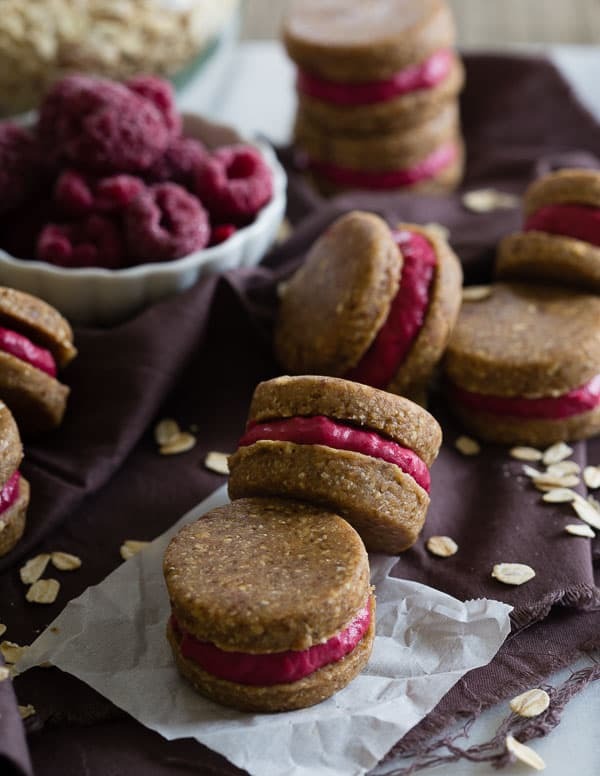 Fast forward to adult life that includes living with an oatmeal cookie obsessed husband and the fact that I tend to make better health decisions now than at 8 and we have no bake oatmeal raspberry sandwich cookies to talk about today. I joke with friends that there should be a big “X” through the “Running” part of this site’s name since running doesn’t really happen much anymore in these parts, but after these cookies and the use of a shot glass since my kitchen is devoid of a circular cookie cutter, I’m thinking it “Ghetto-ized Kitchen” might be a better name option. Seriously though, it was the perfect size and I’m glad I didn’t end up pulling the trigger on the nested set of circular cookie cutters I had open on Amazon all day because there’s really no need. These oatmeal sandwich cookies, ghetto or not, are a far cry from Little Debbie. First of all, they’re no bake. Can I get an amen? Secondly, the ingredient list consists of 6 very good for you foods. But most importantly, they taste incredible. 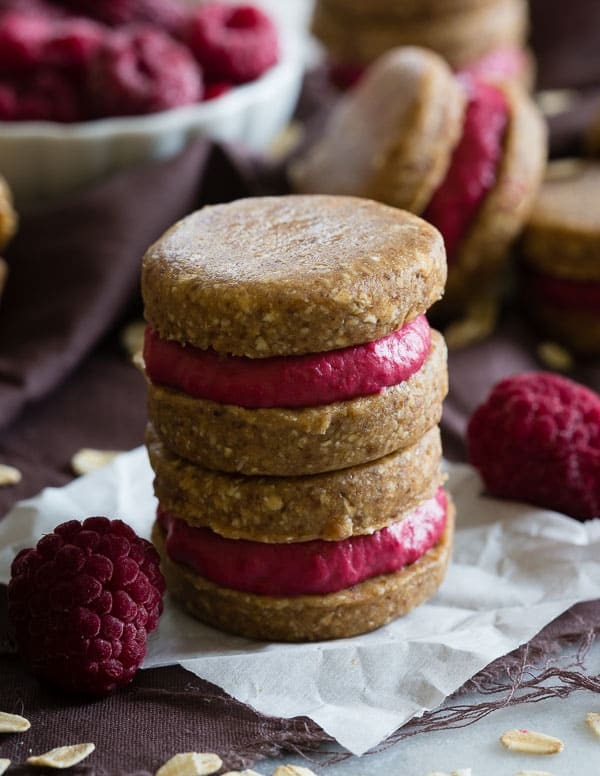 A fresh raspberry and coconut butter puree is sandwiched between the perfect gluten free oatmeal cookie. 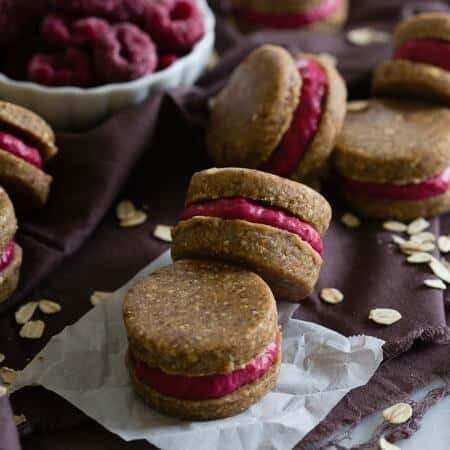 Made with Bob’s Red Mill gluten free rolled oats and medjool dates, these are cookies that can be eaten any time of day, not just for dessert. These paleo lemon macaroons and these almond chocolate thumbprint cookies are also great gluten free dessert options! Combine the oats, dates, coconut oil and vanilla in a food processor and process until a ball of dough forms. Place in bowl and refrigerate for 10 minutes. Remove the dough from the refrigerator and place on a piece of parchment paper. Place another piece of parchment paper on top of the dough and roll into a circle with a rolling pin until the dough is about 1/4 of an inch thick. Using a small circular cookie cutter (I actually used a shot glass), cut the dough into circle shaped cookies and place on a parchment paper lined baking sheet. Re-roll any excess dough until you get all the cookies you can out of it. Set aside. Combine the raspberries and coconut butter in a food processor and process until smooth. You want the coconut butter somewhat warm so that it blends smoothly into the raspberries. Spoon the raspberry mixture onto half of the cookies and place the baking sheet in the refrigerator for about 30 minutes until the raspberry mixture has hardened. Remove from the refrigerator, place the plain cookies on top of the raspberry filled cookies to create a sandwich. *This post is sponsored by Bob’s Red Mill whose products I use all the time and love. All opinions and content are my own. These cookies are what perfection look like. Any no bake cookies are the way to my heart! These are so fun!! I love the filling in these. Okay, I am loving everything about these cookies. 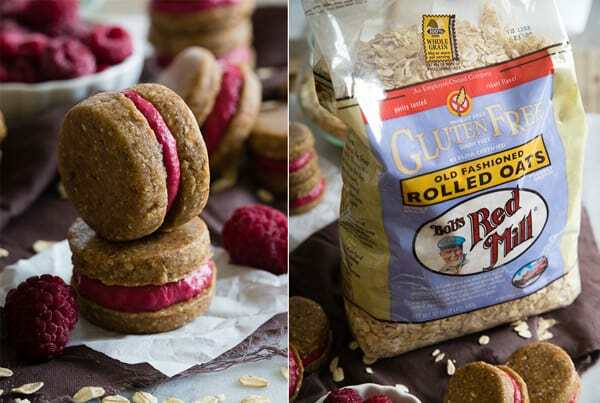 No-bake, natural sweeteners and raspberries…yes, yes and yes! I LOVED those oatmeal creme pies. I haven’t had one in years, so i can’t imagine what I’d think of them now, however. And these cookies look amazing. I love that there’s no baking involved!! Oh, Happy Birthday you pretty young thang (coming from someone midway through her 40th year) These look utterly amazing and quick enough to whip up right now so we can pack them for our ski trip tomorrow. Thank you for saving the day and wishing you the best year yet! Ahhhhhhhhhhh!!! I HAVE to make these! In fact, I cannot make them fast enough. And I am right there with your hubby, an oatmeal cookie is the way to go! I would rather have choc. chip oatmeal cookies over a regular joe any day. So I support his obsession! I am totally going to try making these SOON! They look amazing!! Love this recipe!! I’m a fan of Bob’s Red Mill products too :) Can’t wait to give these a try! Could the coconut butter be replaced with anything? I can’t find any where I live. Thanks! These look fabulous! Great idea to mix fruit with coconut butter for a filling! I’ve made this several times already, and it’s so yummy, but my dough never fully forms into a ball in the processor and doesn’t have the same texture as in your photos. I’ve found that I’ve had to add more dates and a little more coconut oil and knead the dough to get it to stick. Maybe I’ll try soaking the dates next time and that’ll add a bit more moisture to the dough. Any other suggestions? HI! For the cookies you used coconut oil but for the filling you used coconut butter… Are those two different things? I am not familiar with coconut butter, I use just oil. So can I use oil in filling too? Thanks! Yes, coconut butter is more like a nut butter. You can find it usually in your natural foods store or Amazon. Please, how many cookies is this recipe ? 10 as it says at the top of the recipe card. These look Tasty yummy! Great idea to mix fruit with coconut butter for a filling!